Rockefeller explained his interest in Lincoln Center both by the particularities of the historical moment and the legacy of the arts beyond those particularities. He reasoned that postwar society in the U.S. was in an era of prosperity, with more leisure time available to more people than at any other time in history. The arts served to fill leisure time fruitfully, and spiritually. For while economic needs were being met and scientific advances in medicine had increased longevity, people’s spirits were diminished, and the arts could satisfy yearnings for fulfillment on a deeper, more meaningful level. Rockefeller also noted that famous cities in history – Rome, Athens, Paris, Kyoto – were known for their arts, not their political, economic, or business successes. Rockefeller was also concerned with the international dimensions of the United States’ power and recognized that most countries did not think highly of America’s culture. In his view, Lincoln Center would feature the best of the performing arts from the U.S. and provide a place to present the best of the performing arts from countries around the world to U.S. audiences. For Rockefeller, then, the performing arts in the 1950s fused the specific needs of the historical moment with a long-lasting, worldwide legacy. The moment was also ripe for patrons of the arts to look to John D. Rockefeller, 3rd. In 1953, Rockefeller wanted to become involved in a philanthropic project in New York City, hoping to contribute something to the city he loved and which had been home to much of his family. Although it is unclear who first brought the idea of an arts center to him, New York University began to research the possibility of a center of postgraduate training in the arts and had approached both John and David Rockefeller about supporting such an idea.This request probably prompted John to ask trusted people in the office of the Rockefeller brothers, such as Dana Creel and Lewis Strauss, Dean Rusk, president of the Rockefeller Foundation, and Wallace Harrison, the “family” architect, about whether the family should back an arts center. There was even speculation about locations, such as north of the United Nations or in between Rockefeller Center and the Museum of Modern Art. But extended discussion about involvement in the arts began in 1954 when Lincoln Kirstein, then Managing Director of City Center, began conversing directly with John D. Rockefeller, 3rd, trying to convince him to come on its board. City Center – and Lincoln Kirstein – are more crucial to the development of Lincoln Center than has been noted. Not only was City Center beginning discussions about creating a larger cultural center, perhaps associated with a university, but it already was a kind of model for what Lincoln Center wanted to become – a house that offered opera, drama, dance, and music that drew a varied audience of mixed income levels. 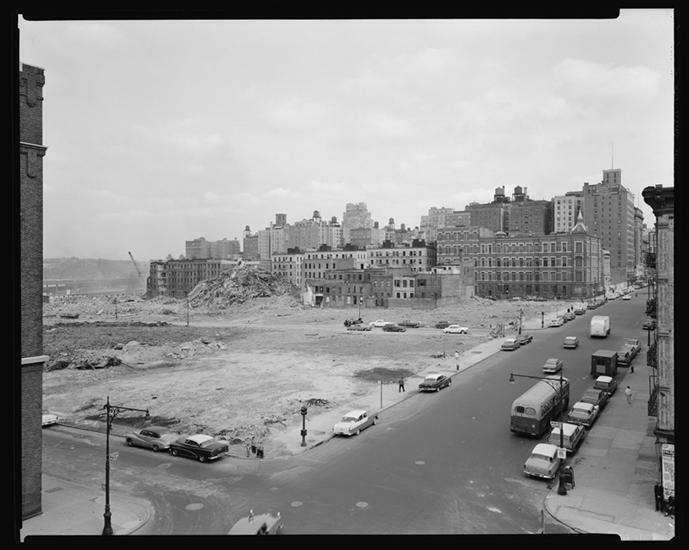 The Metropolitan Opera, Philharmonic Society, and Robert Moses overshadowed the role of City Center, however, when, in 1955, these players set their sights on a plot of land available on Manhattan’s west side for a new cultural complex. While the story of a new home for the MET and the ever-impending doom of Carnegie Hall, then home to the Philharmonic, are well-known, the years-long negotiations with City Center frame one of the crucial issues at the heart of the development of Lincoln Center: who are the arts for? “Mass vs. Class” was the way that Edgar B. Young, the associate of John D. Rockefeller, 3rd, most involved in the project, put it. City Center began as a city-sponsored institution in 1943 and pledged in its charter to maintain a low-ticket price policy so as to attract the widest possible audience for its opera, theater, and dance. Lincoln Center had similar aims in terms of attracting a wide audience, but was less firm on its commitment to low-ticket prices. Whether the arts served the “carriage” trade, the elite classes, or the masses was the debate that shaped Lincoln Center – in architecture, politics, fundraising, and choosing constituent companies. 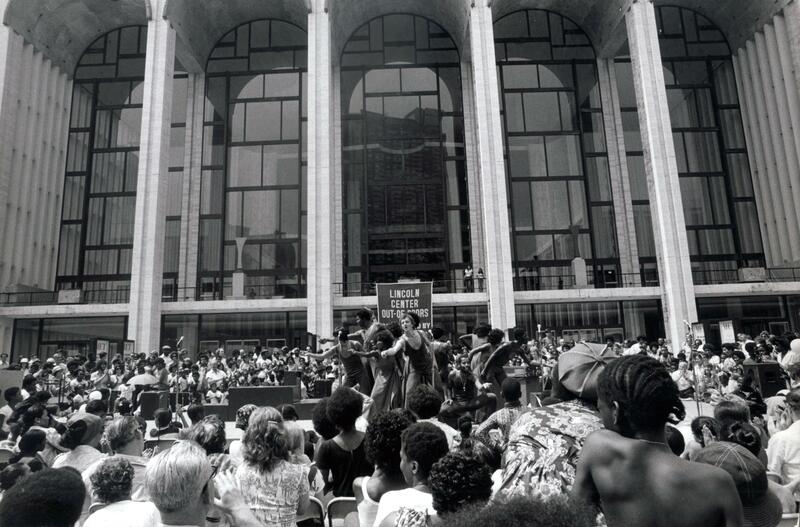 Critics of Lincoln Center, then and now, often dismiss it as an institution bound to elitist notions of art, perpetuating all the attendant social discriminatory practices of class politics in the United States. But this understanding of Lincoln Center fails to grapple with the serious and concerted intention of its developers to subvert that notion of the arts. Exactly what ideals did Lincoln Center embody? And were those ideals realized? show at the circus.” The way Lincoln Center promoters envisioned emphasizing mass over class was to broaden the audience base for opera, symphony, and theater, not change what kind of cultural offerings might be included. The grand vision of Lincoln Center – the largest home and monument to the performing arts ever constructed – called for a populist appeal in a country dedicated to democratic ideals at a time when the arts were utilized as a weapon in the Cold War. Cultural programs financed by the State Department went to countries in Africa and Latin America teetering on the edge of communist rule. Featuring jazz by African Americans and abstract expressionism by visual artists, these programs proclaimed that art flourished in the individual freedom guaranteed by democracies. Lincoln Center played both sides of the cultural Cold War, first by claiming “high” culture for everyone, bringing beauty to a broader, larger audience. “The arts are not for the privileged few, but for the many,” Rockefeller wrote, words that adorn a plaque in his honor at Lincoln Center. Secondly, Lincoln Center aimed to best European countries, especially Germany and Russia, in their heralded traditions of opera, classical music, and dance. like shapes of the theaters, covered in travertine marble that unified their facades, offered little warmth and invitation. In many ways, Lincoln Center represented the endpoint of high modernism in architecture and prompted attacks from critics and architects of the emerging school of postmodernism. Even as early as 1958, Jane Jacobs ridiculed the design, claiming that “Lincoln Center is planned on the idiotic assumption that the natural neighbor of a hall is another hall.” She thought the city would be better served if cultural institutions were dispersed around the city, spreading improvement in a variety of neighborhoods. Isolated from pedestrians and the surrounding neighborhood, cold and imposing in its absolutist forms, Lincoln Center’s architecture reflected its emphasis in programming on traditional performing arts. “A Highbrow Ideal, Lincoln Center Is A Likely Middlebrow Monument,” Ada Louise Huxtable, the architecture critic of the New York Times, titled her review of it. Lincoln Center’s status as a monument – beckoning worldwide attention to cultural aspirations of the United States – overwhelmed its neighborhood. As an urban renewal project, Lincoln Center incurred the social costs of many other such projects, demolishing homes and livelihoods of lower income people, many of whom were African Americans and Puerto Ricans. The relocation process stirred some controversy, but less than other projects of greater magnitude, such as the Cross Bronx expressway. While the center paid some attention to its surrounding neighbors, repairing an arch of a church nearby, for instance, its primary focus lay beyond the neighborhood. No local, community people sat on its board; the very few representatives of the city on its committees were those with broader political power. And, perhaps more enduring, the masses Lincoln Center hoped to attract rarely encompassed the people removed from the site or those that remained nearby in low-income housing. The masses that gathered more attention from Lincoln Center promoters were those middle-class audiences who had recently moved to the suburbs. The people driving to the center from New Jersey received priority over those who lived on 66th Street who missed the small shops and well-known faces that make a neighborhood. The architecture and organization of Lincoln Center displayed the grand – and contradictory – ideals of its developers. The 1960 photo album of John D. Rockefeller, 3rd, includes titles to the pictures and one in this album features a group of businessmen sitting around a large, dark mahogany square table, most likely at the Century Club in Manhattan, and entitled “Organizers for Culture.” To a large extent, these men created Lincoln Center; they had the power to push conservative, recalcitrant institutions like the MET to be a part of a shared endeavor and they had both the political and financial acumen to rally necessary partners, such as Robert Moses and Mayor Robert Wagner. Almost all of them, however, were businessmen with an avocation for the arts and little direct experience beyond spectatorship. The locution of the title is intriguing for its recognition of this: these men are organizers for culture – builders, promoters – rather than of culture – producers, impresarios. This may have given them an advantage in that they had managerial practical minds instead of temperamental artistic souls. They spent considerable time number-crunching and focused on the hard work of pulling together the huge amount of money needed and overseeing the long, difficult construction of so many buildings that had very precise and often conflicting specifications. But they also spent a great deal of time consulting with people in the arts, relying on others’ visions of what such a complex might be. In fact, one of Rockefeller’s first moves was to hire a consulting firm, Day & Zimmerman, to conduct an extensive review of the project. He then held two crucial meetings early in 1956, one with leaders in the performing arts, primarily businessmen and politicians, and the other with arts educators. Even in this attempt to draw upon others’ expertise, however, artists themselves were rarely included, and, when they were, rarely accorded much say. This tension between needing others’ opinions and yet spearheading the project was, perhaps, most manifest in the decision to have a different architect in charge of each building. “Six Architects in Search of a Center” was how a 1959 New York Times article characterized the struggle. Even though Wallace Harrison served as head architect, Rockefeller and others questioned his ability to corral the group – and to come up with a compelling design for the MET. Harrison’s lack of ideas, difficulty in working with the demanding MET staff, and inability to curb a ballooning budget led Rockefeller to contemplate firing him in 1961. Rockefeller stuck with Harrison, and that decision reflected many others when decisions had to be made with choices that were equally problematic. If the Rockefeller Foundation’s significant contribution rested, in part, on a Rockefeller being at the helm of the project, the supportive role of many Rockefellers provided even more necessary aid in the realization of Lincoln Center. In money alone, Rockefeller family and foundations gave almost 45% of the cost of the entire project (with John D. Rockefeller, 3rd, himself, providing about 7.5% of the total). As president of the Rockefeller Brothers Fund in the early 1960s, Laurence Rockefeller ensured that Lincoln Center received a significant contribution of 2.5 million dollars in 1962 at the time when the fundraising campaign was suffering from repeated requests, ever-rising construction costs, and one building not yet fully complete. David Rockefeller solicited Greek shipping tycoons for contributions and also commissioned the artwork “Archangel” by Seymour Lipton for Philharmonic Hall. Nelson Rockefeller, however, provided perhaps the most crucial aid. One of his first acts as Governor of New York, was to host a dinner at his home on January 9, 1959, with Robert Moses, Mayor Robert Wagner, City Center officials, and his brother John. This meeting covered a range of issues, from the size of the park that Moses insisted upon on the southwest side of the complex to the financial contributions of the city and the state. Nelson pushed for the city to underwrite the cost of the library/museum building and, by 1960, had committed the state to paying for construction of the dance building to be used for the World’s Fair of 1964-65 and named the New York State Theater. Throughout Nelson’s years as governor, John consulted with him on Lincoln Center affairs. He asked for help in prodding Mayor Wagner to come through on the city’s payment of the library building and relied heavily on Nelson and his assistant, William Ronan, in the final, bitter negotiations between City Center and Lincoln Center over the terms of its constituency. John D. Rockefeller, 3rd, worried that Lincoln Center would become known as a Rockefeller venture, and sought to dispel that idea throughout his years as leader of the project by giving money anonymously and consistently speaking of the other people, foundations, and, most of all, the institutions of arts involved. The support of the Rockefeller family, particularly the brothers, was critical to the completion of Lincoln Center, however. In fact, I was most struck by how much the history of 20th-century New York City owed to the entire Rockefeller family. “This morning I took a taxi in front of the United Nations building to Lincoln Center to attend the Ground-Breaking Ceremony and on the way I passed Rockefeller Center. It was a trip which brought home to my mind very strongly how much the City of New York owes to you, your father and your brothers,” wrote Clark M. Eichelberger to John D. Rockefeller, 3rd, on May 14, 1959. At that time, Eichelberger could have added Riverside Church, Morningside Heights, the Cloisters, and the Museum of Modern Art to the tally, and the World Trade Towers would join the list within fifteen years. It is a record of re-invention of the city that is surpassed perhaps only by Robert Moses. Lincoln Center serves as a window on to both the obvious and subtle ways in which the Rockefellers shaped New York City. As home, the base of business and politics, and a crossroads of international interests, New York City bears the indelible and long-lasting imprint of the philanthropy, activism, and ideals of the Rockefeller family.